Incorporated in 1962, Geonics Limited is a world leader in the design, manufacture and service of electromagnetic (EM) geophysical instrumentation. From a commitment to address the varied, demanding realities of the survey environment, Geonics instrumentation has developed an enduring reputation for practical design and reliable operation, supported by an equal commitment to prompt and comprehensive customer service. Ground Conductivity Meters: provide (frequency domain) measurement of subsurface conductivity and magnetic susceptibility for spatial site characterization and detection of structural anomalies, both natural (e.g. bedrock fractures) and man-made (e.g. storage tanks). 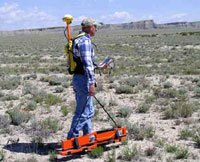 Metal Detectors: for detection of a broad range of subsurface metallic targets, including environmental hazards (e.g. drums, storage tanks), infrastructure, industrial waste, and unexploded ordnance (UXO). 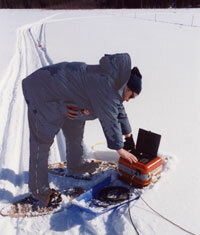 Time Domain Systems:provide measurement of vertical subsurface conductivity for definition of the conductivity / resistivity profile and / or detection of geologic anomalies within an exploration range of 5 m (for environmental / engineering applications) to greater than 1000 m (for deep resource exploration). VLF Systems: receive widely broadcast VLF transmissions for reconnaissance detection of structural anomalies (e.g. bedrock fractures, massive sulphides) and / or measurement of local subsurface resistivity. 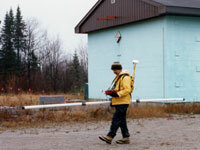 A portable VLF transmitter, for optimal survey design, is also available. Borehole Probes: individually provide measurement of specific soil properties, including conductivity or natural gamma radiation, for an improved understanding of the local subsurface environment; or measurement in the time domain in support of exploration to a borehole depth of 2 kilometres. Data Acquisition Systems: with both hardware and software components, support the collection of data from any Ground Conductivity Meter or Metal Detector; frequency domain-based Borehole Probe are also supported. Software: developed by Geonics Limited, directly supports the collection and processing of data collected with any of the above Data Acquisition Systems. Third Party Software: developed by commercial software parties, directly support the modeling and enhanced processing of data from all Geonics instrumentation.